Well almost from head to toe. At least not on my face. The added benefit downside of taking Warfarin is that it truly thins the blood. I am getting bruises where I never thought I would get a bruise. I have bruises on my wrists, on the back of my arms, on my stomach and sides, and on the top of my feet. I have these little bruises all over my body. I woke up to find this bruise two days ago. It is on the inside of my leg. I have no idea how I got this bruise on the top of my foot. I met yesterday with my hematologist. She had a long conversation with the radiologist. They believe it is a chronic thrombosis most likely from when I was spending so much time sitting back in May and June. However, since they cannot rule out an acute thrombosis, I am on Warfarin until just before Christmas. I asked about the bruises and she just said that it was the downside of the Warfarin. Every time I turn around there is a new bruise that I am discovering. In six months I will have an other ultrasound done on my leg and meet with the doctor so there is a record in case I have another issue of swelling. I am still dealing with swelling of my ankle and calf. I need to order a compression stocking to see if it will help. Has any one had experience with compression stockings? I have found one version (a trouser sock) that does not have latex in it. I still don’t know if I will be able to tolerate the trouser sock. I guess I will find out when I get it. Well it has definitely been pouring at my house and I don’t mean rain. I have been dealing with an ankle that has been swelling off an on for the last few weeks. At first we thought I must have twisted it. This past Wednesday, my osteopath/acupuncturist decided that we have waited long enough. She thought because it was warm that I might have cellulitis (an infection of the skin or tissue). She ordered a round of antibiotics (Ceftin). I had taken it about six weeks ago or less for a sinus infection that would not go away and didn’t react to it. She also decided to be safe and have an ultrasound done on my leg to rule out a blood clot. Thursday morning I started the antibiotic and Thursday afternoon I went to have the ultrasound done. I walked into the room and the technician told me that I would have to remove my jeans and cover up with the sheet. I told her that I didn’t want the sheet on me and asked for a paper sheet which she didn’t have. She left the room and came back a few minutes later with a package of paper hospital gowns. She proceeded to place one on the bottom part of the table and one on the top covering the table and the pillow. She then handed me another to use to cover myself up. She also used the most sensitive gel she had (still left me with itchy legs). By yesterday morning I was feeling some stomach upset from the antibiotic. Yesterday afternoon my doctor phoned to tell me that I had a partial deep vein thrombosis. I could stop the antibiotic but I needed to be on a blood thinner for six months. I told her that I had to think about what my options were. I phoned my internist and had him look over the test results. I also phoned my ENT (both of these doctors have dealt with me from the beginning of this illness). My ENT felt that I should use Coumadin because it was the older of the drugs and less likely to cause as many problems. Also Coumadin is the only drug they can reverse with Vitamin K if my blood becomes too thin. My internist called me back last night saying the same thing and also that he thought it looked like an old clot that was healing but said I still needed to do blood thinners. Last night I was up all night with severe stomach cramps. At 2:00 a.m. I decided to go find the paper that came with my medication. WONDERFUL! This medication can cause a condition called C-Diff (from killing off too much of my good bacteria and lead to a type of colitis). It can happen while taking the medication or a month or more later. So did the three doses I took cause my stomach issues or was it a combination of those three doses and having taken the medication six weeks ago? I spoke with my osteopath today. She wants me to wait until Monday to see if my stomach issues calm down before attempting to start Coumadin. If my stomach issues are not better than I need to be tested for C-Diff. I have spent most of today in bed sleeping either from the fatigue that the antibiotic can cause or that plus being up all night with stomach cramps. I will keep you all updated as I start taking the Coumadin. The usual course of treatment is six months. My osteopath has agreed to do an ultrasound monthly or every six weeks to determine if we can stop it early and get me off the medication. I am not proofing this post because I am just too tired and feel the need to head back to bed. Today I am excited to be hosted on the blog of D. E. Haggerty. It still feels very strange to say, “I am an author”. It still feels strange when those words roll of my tongue! I never set out to be an author. As a child I didn’t dream of writing books like those I loved checking out from the library every week. I was going to be a nurse until I realized that being a nurse meant dealing with needles and blood. To read more of my blog post, visit D. E. Haggerty’s blog and read the rest of my guest post. Please take a moment to leave a comment and thank her for hosting me. I don’t know if my smile is really any brighter but at least my teeth are clean and inspected. This morning I drove across town to my regular dentist (my biological dentist is 45 minutes away so I only use him when I need work done on my teeth). My appointment was at 7:45 a.m. I arrived on time and was taken into the room they use for me. It is a little further away from the other exam rooms. The paper guard was placed over my chest and I was told that my hygienist would be in soon. I sat there with my mask on waiting until I had to remove it to get my teeth cleaned. I now make it a point to go every six months even if it does make me feel bad. If I had been going regularly the chances that I would never have had to have my molar pulled last fall would have been better. My hygienist walked into the room and said to leave my mask on until she had everything assembled. She told me that she had not put on any perfume and then asked another tech where the pumice they use for me (unflavored). She made sure she was wearing latex-free gloves and began my cleaning periodically asking if I was doing okay. Once we were done, she told me to put my mask back on until the dentist could come in and examine my teeth. I did and sat and waited. He walked in shortly after and started to grab gloves, another tech grabbed him quickly and reminded him that he had to use latex-free gloves and then gave him the correct box. He also made certain to tell me that he and the entire office staff were not wearing perfumes or cologne. Mask removed, he examined my teeth and said that they all looked fine and recommended as my other doctors have that I not remove the remaining mercury amalgams unless I have problems….no need to stir up a hornets nest he said. Once finished I walked up to the front desk to schedule my next six-month appointment. While she was looking for the date she told me that one of the girls had sent a text to all the office staff to remind them of wearing perfumes/cologne. Yes my lungs hurt by the time we were done and I coughed all the way to the car and sat in the car coughing and gagging for a while before I felt okay to drive home. But I would have been far worse without the extra special care the staff took to not expose me any more than necessary. Do you have such a dentist? Another one of my amazing doctors. For those of you who have read my book, you know of my gynecologist, Dr. Evans. When we thought I had ovarian cancer and I couldn’t find anyone willing to take me on because of my acute chemical sensitivities and allergies to medications, Dr. Evans stepped up to the plate. I am so lucky to have had him for my doctor and count him as a friend on Facebook today. Thank you Dr. Evans. This is the amazing Dr. Evans that I describe in my book. My husband and I went to the oral surgeon’s office this morning. This is the one that told me they had no air fresheners and the staff did not wear perfumes or colognes. I was a little apprehensive and I purposely had not shared my list of sensitivities with them ahead of time preferring to discuss them with the doctor before they had a chance to say no without seeing me. We arrived at our designated time. I did not detect anything noticeable while I sat in the waiting room. Within a few minutes I was taken to a room and again I didn’t notice anything horrible. The dentist came in (boy was he young) and discussed why I was there and did an x-ray. He didn’t seem put off by my long list of allergies and sensitivities. He came back and said he could extract my tooth today. I told I thought I was there for a consultation and was told that they had actually scheduled me for the procedure. He went to look to see if they had any epinephrine-free carbocaine. They had it – so I could have it done then or I could reschedule it and go home and come back. I knew how difficult it would be for me to make that next appointment. So, I just went for it. They allowed my husband to stay in the room. I loaded my syringes with histamine (which thankfully I didn’t have to use) and we got started. The tooth wasn’t going to willingly come out so the dentist had to cut it in pieces to remove it. There was no pain really. The worst was the horrible pressure. When it got bad I thought back to my energy balancing days. I put myself in a state where my breathing was so slow I wasn’t sure I was breathing and took my mind away from the pressure. All of a sudden it was done and he was putting sutures in. The dentist was afraid of the dissolvable sutures because I might react to what was in them and opted to use silk so I will be making a trip back next week to have them removed. All in all, my jaw is sore from having my mouth open and I am bleeding a little more than most because of the lack of epinephrine in the carbocaine. I am icing my face and taking it easy. As long as it heals well and no infection sets in I will be fine in a few days. I am just glad this hurdle is over and I didn’t have any horrible reactions in the process of getting the tooth removed. P.S. The dentist said he has seen a few others with a laundry list of allergies like mine but never with histamine instead of epinephrine. This was originally posted on June 13, 2012. Surprisingly when I have looked at the search engine terms that have led others to my blog, this has been a question posed more than once. I guess I am not the only one who has felt like this. — A side note is that at the end I talked about my cover photos – – the cover is done and everything has been submitted. Hooray! Valentine’s Day 2001 was anything but romantic. I had been on the IV for a few days and the antifungal drug and oral antibiotic for close to a week. I had gone to work as usual…..Shortly around noon, my throat began to feel restricted. I tried to wait it out. Finally I phoned Dr. D. He suggested that I go to the emergency room. I drove myself to the hospital, which, I realize now, was probably not the smartest thing to do. While waiting to be seen, I phoned Sarah. I asked her to pick up her father as soon as he got in from school and to drive him to meet me at the hospital emergency room. The constriction in my throat began to get worse and I was beginning to have tremors. My face felt like it was being pulled apart. The ER doctor came in. 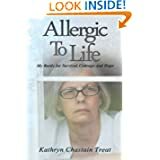 I told him—in between spasms in my throat and face—that I was having an allergic reaction to one or more of the medications that I was taking. He asked what medications I was taking and why I had an IV line….. The ER doctor had the gall to tell me that my reactions were not typical of allergic reactions. I was just having an anxiety attack. Some of the same symptoms began while we were working on the soup. My throat began to get tight and feel constricted. We phoned Dr. D, and he told me to come to his office. Unfortunately, he was not in his local office. Sarah drove me about six miles to see him at his other office. By the time we reached Dr. D’s office, I was beginning to have tremors. He ordered an EKG and had my blood sugar tested. My EKG was normal, as was my blood sugar level. The tremors and spasms in my face and neck continued to get worse. This time, however, I also began to have tremors on the right side of my body. My right hand and leg would shake. During the spasms in my neck, I had difficulty breathing. The doctor’s staff would ask me questions. I would not answer right away so they would ask them again. I had no control over my body. I had to wait for the tremors and spasms to stop to answer questions. It was if I were riding a wave. I would have a spasm and tremors and then it would stop, only to start up again within seconds. It was almost like a seizure. I was so frightened, and I hated that my Sarah had to see me in this state. I didn’t want to die here, not like this! Dr. D ordered an ambulance to take me to the hospital. The tremors and spasms were getting out of control and I needed to be in a hospital setting. I remember hearing his nurse asking if he wanted lights and sirens. He responded yes! He wanted the ambulance there as soon as possible. Hearing the urgency in his voice only made me more terrified. I became increasingly sicker and had a fourth sinus surgery while in the hospital and developed so many problems that we had to stop most of my medications to see what was causing what. I was on an oral antifungal, oral antibiotic and IV antibiotic. After all this, I thought the worst was over and my journey towards wellness would begin. I had no idea what was to come. The tremors and the pulling apart feeling in my face (as if someone was taking my skin and stretching it over facial bones that were too big for it) soon came to be a common occurrence when I reacted to chemicals and molds. It is because of the skeptics like the doctor in the ER on my first visit and those who know I have been sick but not really known what I have gone through that I have written my book. There are still so many out there who do not believe mold can make you chronically ill and that there is such a thing as multiple chemical sensitivity. I hope to have the final edits soon so that I can get my cover photos done and submit it. Well I am back to square one with my tooth. The oral surgeon that I had an appointment with later this month has decided after reviewing my history, allergies, and sensitivities that I would be better off somewhere else. I am now being referred to an oral surgeon’s office an hour from me in the other direction from the first one who refused me. It is a satellite office of the University of California San Francisco. He thinks it is a better setting for me and they will be more equipped to work with me. ARE YOU KIDDING ME? They won’t do anything any different. He is just covering his behind. The office person said I can understand your frustration. I told her she had no idea my frustration and I hung up. Tomorrow I will call the other office and see what is going on. What infuriates me even more is that I moved my LDA treatment back a month to get this tooth done. I may or may not be able to get my old appointment time back. If not, then I have to keep my August appointment because I cannot go longer than six months without my treatment. This means that I won’t be able to get my tooth pulled until at least late September. Keep a good thought for me as I try to sort this all out. I have read many blog posts recently on vaccinations. I have not spoken about them on my blog but have commented on other blogs why I have a negative view of vaccinations. I have mentioned it is because I have seen what happens first hand. I do not view my blog as a means for politics or political statements. I do view my blog as a means of offering support to those suffering from allergic reactions, sensitivities, mold exposure, food allergies, and chronic illness. What I am going to talk about today, while it can be construed as political, relates to an allergic reaction to someone very dear to my heart. I am going to start from yesterday and work backwards. My daughter phoned me yesterday to say that my grandson (now 2) had eaten a bite of pickle that a friend of hers had canned. A while later he had a bright red rash all over his face. She phoned her friend and got the list of ingredients. The only ingredient that he hadn’t had in some form before was alum (Usually when you hear about alum it is in reference to potassium alum, which is the hydrated form of potassium aluminum sulfate.) I advised her to give him some Benadryl and to watch him. She began doing some research on alum and realized he was reacting to the aluminum in the pickles. She called me back because she began thinking about vaccines and metals (aluminum is commonly used as an agent in the push of vaccines). When my grandson was six months old he received the Dtap vaccination. Within a week while I was babysitting him, he became unusually fussy and was crying quite a bit. My daughter picked him up and he screamed all during their 45 minute commute home. He continued to scream for four more hours and his pediatrician was phoned. My daughter was advised to rush him to the Children’s Hospital an hour from her home. Her mother-in-law rode in the back seat with him trying to comfort him while he continued to scream. Eventually he fell asleep from all the screaming. The hospital thought maybe he had telescoping intestines because of the way he was screaming and his leg movements. The hospital is also an hour from me. I gathered my jacket, my charcoal mask, my histamine, my epinephrine, and Vitamin C. Off I drove to meet her and offer comfort. The poor baby was screaming and they were desperately trying to get an IV in him without fail. After the cat scan showed nothing, they told her to take him home because they couldn’t determine what was causing him to be that way. Rhett was a happy baby, had already said momma, was batting at his toys and trying to roll over. Suddenly he had a vacant look to him. We noticed that one of his eyes was too far to the right. He quit doing anything at all. Fast forward a few weeks after the screaming, we were driving and she immediately asked me to look at his vaccination record to see when he had the last vaccine and what it was. It was the dtap and we began researching. We learned that this type of reaction is considered a moderate reaction and can happen up to seven or so days after the vaccination (see below). The same time period for the screaming and flailing he had displayed. The pediatrician believed he had a reaction to his vaccination. For the next six months he wouldn’t go from lying to sitting up, wouldn’t roll over, wouldn’t interact with any toys, and his eye continued to focus outward. My daughter began making phone calls for services. She took him to a physical therapist for infants. She took him to an eye specialist for children whose advice was patching the good eye and forcing the bad to try to focus inward. The two biggest things she found were actually free services. She contacted the Central Valley Regional Center who evaluated him and because of his delays he qualified for weekly sessions at her home. She also found that the Elks’ Lodge near her offered free occupational therapy services for children with delays. The occupational therapist is a licensed cranio sacro therapist as well. Shortly after his first birthday he began the occupational therapy. One day while visiting my daughter, an amazing thing happened. We were all outside and the baby was in his crib. My daughter walked in to find that he was sitting up. She put him back down to sleep and came outdoors. I walked in to use the bathroom and discovered the same thing. This time she put him down and closed the door slightly and we all peered at him and he had figured out how to sit himself up. This happened two days after one of his occupational therapy sessions. Since then we have come to see new things happen after many of his sessions. My grandson is a happy and healthy baby. At two years old he is walking and running after his sisters but isn’t talking. He says a few words. This past Friday he was babbling like crazy and laughing like children do just before they begin speaking. He had a session where the occupational therapist worked on his speech skills the day before and we are hoping this is a sign to more verbalization. My daughter has vowed that he will get no more vaccines and his sisters will not get any more. She is finally at a point where she can speak out about what has happened. She tells other mothers what happened to my grandson but then tells them they have to make their own choices. We are hopeful that he will continue to move forward in his development and one day catch up to where others his age are. Approximately twenty-five percent of children who receive the DTaP vaccine experience minor side effects. These include low-grade fever, redness, swelling or tenderness at the injection site. Additionally, children may become fussiness, tiredness or vomiting following the immunization. Moderate to severe side effects occur less frequently and include seizures; non-stop crying that lasts over three hours and fever over 105 degrees F. Rarely, children experience life-threatening allergic reactions and permanent brain damage. period of at least 6 months from the date of vaccination.